Nižinskyj | Conservative Political Comment: 260 days without government: such a bad thing? It never ceases to amaze me how ungrateful we British can be to a nation that gave the world waffles, fries, praline, Tintin, liver pâté, Früli beer, Henri Pirenne, Soulwax and the humble sprout; but Belgium continues to receive a bad press in this country. And the sheer frequency of unchallenged non-truths and irrelevancies that make their way into print is really quite shameful. 'It's not a real country!' they cry. 'They don't even speak the same language!' others are known to shriek. Well, quite right, but then neither do the Swiss, Canadians, Russians, Chinese or Indians. I'm not sure many would argue their homelands aren't 'proper' countries. Belgian history, too, is often the subject of some pretty whacky interpretations. The last time the press were egging on the Vlamingen and Walons to part company, there was no shortage of hacks making it known that, anyway, Belgium was 'artificially' cobbled together by the Allies in 1814 as a buffer state between France and her eastern neighbours. What utter codswallop. Belgium came into being in 1830 as a result of a popular Catholic revolution (beautifully captured by painter Gustave Wappers) against the Protestant Dutch king, Willem I, under which they had actually been made subject to by the Allies in 1814. True, the sudden appearance of this new nation was very convenient to Britain and the European powers who still feared France, and was probably the reason why it was recognised so quickly by pretty much everyone except Willem, but that does not excuse the complete fabrication of a country's history. Forgotten too, is the fact that, although Belgium sprang from a largely (though not exclusively) religiously-motivated uprising, it was forged into a secular, liberal and (by the standards of the time) democratic state under a constitutional monarch. Like the United States, it was founded on principles and ideals rather than on ethnic identity. Not too shabby for the early nineteenth century and certainly deserving of our respect. Of course, today, Belgium is a very different place from the 1830s. A largely non-religious country, the ties that bound its French- and Dutch-speaking inhabitants are not what they once were and the now-federal state does not even have any pan-Belgian parties. This, together with a system of proportional representation for parliamentary elections, has contributed to numerous political crises of late and increasingly lengthy periods where there is no government at all. The latest of these interregnums broke a new world record ten days ago, when it hit 249 days, trumping post-democracy Iraq's 248. But the question to ask is, is it really such a bad thing? 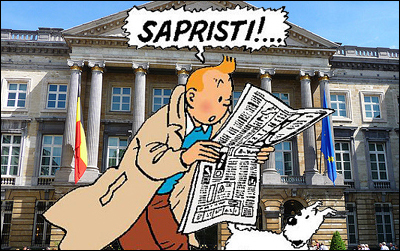 After all, the foundations of Belgian society have not come crashing down, there is no looting and rioting in the streets, the buses and trains still run - things are carrying on as normal. Perhaps every country ought to go for these periodic 'holidays' from government - it would certainly go a long way towards demonstrating just how pointless these endless, money-burning 'initiatives' and 'new deals' really are. Daniel Hannan suggested a very similar thing to expose the irrelevance of the European Union but this principle really could be applied to any government. It is certainly needed in this part of the world. An unfortunate aspect of our political culture is that politicians are expected to constantly look busy and, as such, are encouraged to encroach further and further into our lives and spend ever more of our money on nonsense. You may remember that, during the election, when Boris Johnson was refusing to be brow-beaten by Jeremy Paxman, Paxo used his get-out-of-jail-free card by retorting 'haven't you got a city to run?' Priggish as it is, this is an unanswerable question for a politician, so Boris shuffled off, dejected. That Paxo was able to get away with this shows the sorry state of out political culture - decades of statism have led us into the terrible mental trap of assuming that, without the constant direction and supervision of politicians, our infrastructure and services would simply fall apart and that, consequently, all our problems are remediable by these great caesars. It's a curiously Stalinist political outlook - "a light is always on in Stalin's window" as Russians were once told - but this is the type of (fictional) dedication we appear to expect from our politicians. There was a quite perplexing outcry in some circles, for example, when Boris revealed he would continue to write a weekly column for the Telegraph after he was elected mayor. That this takes him probably an hour or two on a Sunday afternoon is irrelevant to these people - he was scandalously taking the time to do something unrelated to his position, which was apparently self-evidently damning. Just as much tosh is the supposed shame of Nick Clegg forgetting he was 'supposed to be running the country' while David Cameron was in the middle east; instead going to Davos. It was not believed that he could do this from his Blackberry. But why not? Did anyone notice society collapsing while the PM and his deputy were out of the country? Did the wheels of government suddenly grind to a screeching halt? Did Ed Miliband organise a Gaddafi-esque military coup? Of course not! Cameron and Clegg are not czars, caesars or kings and this country fought for centuries to set in stone the principle that the realm ought never to be run by one man. So I say rejoice in lazy politicians! Take comfort in their absent-minded sense of duty! And delight in their inability to agree on a cabinet! Because if they're not in parliament, or in Number 10, they're also not doing either of two things: poking their noses into your business and burning your money. That, I'm sure you'll agree, is no bad thing at all.